Use a sketch to build your own Halloween card. I used an ebook, 50 Card Making Sketches, for my handmade card ideas and to make cards for Halloween. 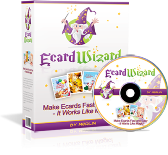 Measurements, directions and images of the finished cards are included in the ebook so it makes handmade card making faster and easier. If you need birthday sayings, the ebook includes several quotes to use on your paper card making ideas. For those of you who are just starting out, the ebook has tips on card making tools to help guide you with what supplies you might need to get started. Also included is a book on adhesives which comes in handy since there are so many to choose from. The author gives you tips on how you should adhere vellum since it's a bit tricky. Overall, there's a lot of helpful information from the set of ebooks. For your homemade greeting card ideas, you can alter the sketch a bit and that's what I did for this happy Halloween card. When you are using a sketch you can follow the sketch exactly as you see it or play around with the layout a bit. The image I used was a little bit bigger than the one on the sketch so I placed my sentiment in the middle of the card instead of it being higher on the card. This was a simple handmade card making project. 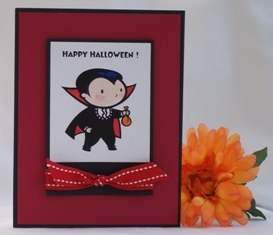 For this Halloween greeting card, I started with a clip art image of a cute vampire. I colored in the image with markers but you can use your favorite pens, chalk ink or whatever you are comfortable using. If you go to Microsoft's website, you can find lots of clip art images to download to build your own Halloween card. Making Halloween cards using clip art images makes card making quicker and cheaper since you don't have to buy any stickers or draw the image on your own and there other lots of other categories to choose from to get you started on your paper card making ideas. I often type the sentiment on my computer for my homemade card ideas and I used a font called Boogie Woogie when making this Halloween card. After typing the sentiment over the image, I printed it out on cardstock paper and then colored it. I then placed it over black paper. For your homemade Halloween cards, use the colors on the sticker or clip art when you are picking the background colors. I used red and black for this Halloween card idea but I could have used black and orange as well. You can find the rest of the instructions and measurements on the ebook 50 Card Making Sketches to make this Halloween card craft. You can make Halloween cards simple or elaborate. I chose to make mine simple but if you wanted to add glitter, you could color the cape on the image with red glitter or the vampire's Halloween bag orange. You could also add a brad on all four corners of the sentiment or on the ribbon knot. Handmade Halloween cards are fun and festive to make and you get to use fun and bright colors so it's never too early to build your own Halloween cards. finished cards and you can safely download it right away. There are lots of templates to choose from or create your own cards like I did.